This Tuesday, Israel-based Dapper will launch the private beta of Facebook AppMaker, a new tool that the company claims will provide people with a dead simple way to create new Facebook applications. At its core, Dapper allows users to create API’s called “Dapps” by selecting data from Websites, RSS/XML feeds, Google Gadgets, and more. Each “Dapp” is an XML which can be manipulated in any number of ways. The company released a tool to create Netvibes modules in late 2006. Dapper’s Facebook AppMaker lets these Dapps be transformed into full-blown Facebook applications. This includes functionalities such as remote search and retrieval, remote login, and multi-page apps. A Facebook Developer account is a prerequisite to the AppMaker process itself. The test app I created was an effortless process: I created a Dapp, entered it in the AppMaker wizard, entered the appropriate Facebook’s API/Secret keys, saved and installed. While creating a Dapp was not a sophisticated process on Dapper’s side, it certainly could be more intuitive. I found the Facebook side of the process to require a higher degree of technological aptitude. 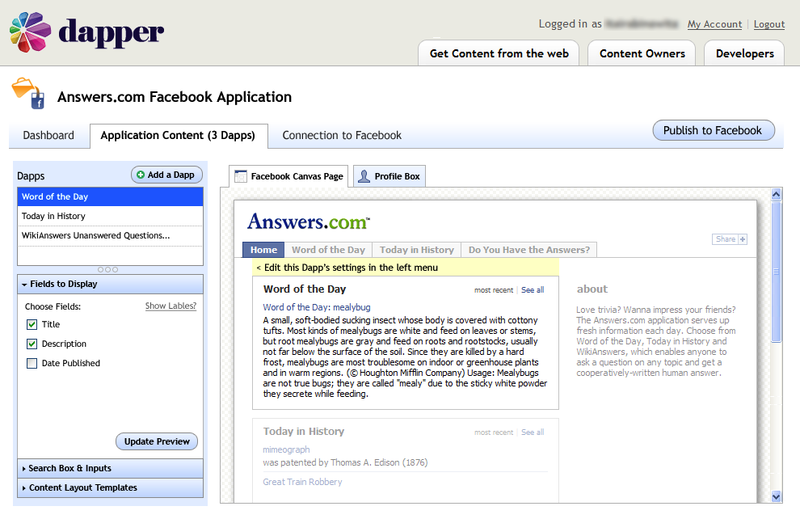 Dapper is debuting the AppMaker with an Answers.com application that features three applets: Word of the Day, Today in History, and Do You Have the Answers? Another already available app is Go2Web20’s. Expect an additional application to be launched in the next couple of days with a “high-profile” media player. Headed by Eran Shir (CEO) and Jon Aizen (CTO), Dapper employs a team of 15 and is in the midst of setting-up an office in San Francisco. In 2006, the company secured a $1.2M funding round from Accel Partners. The company first launched in August 2006 and we covered them as part of a roundup post along with Yahoo Pipes, Teqlo, Proto and OpenKapow in March 2007. Sign-up for beta access by emailing techcrunch@dapper.net.